lunch @ castle on the hudson preview. So I've been crazy busy, like epic proportions busy and let almost everything I do for myself fall to the wayside. For example, I took these photos in July and am just getting around to posting a preview. I plan on having a more substantial post this weekend. 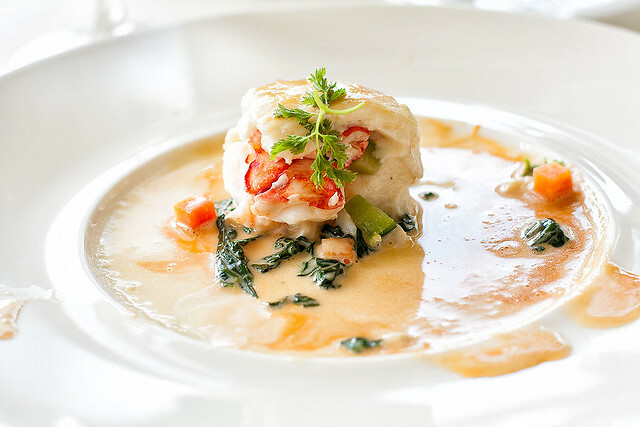 Suffice to say I still dream of some of these dishes.. creamy, buttery, delicate nomness. This was one of my favorites: lobster wrapped in another fish and oozing with deliciousness. Castle on the Hudson is one of my, "if I had an unlimited budget," wedding venues, but since I don't and since it's around $250 a person I'll have to remember my lunch there with fondness. In "castle on the hudson", "lobster", "lunch", "preview", "seafood", "wedding"